All roads lead to Baghdad and the Islamic State in Iraq and Syria (ISIS) is following them all, north from Syria and Turkey to south. Reading Western headlines, two fact-deficient narratives have begun gaining traction. The first is that this constitutes a "failure" of US policy in the Middle East, an alibi as to how the US and its NATO partners should in no way be seen as complicit in the current coordinated, massive, immensely funded and heavily armed terror blitzkrieg toward Baghdad. The second is how ISIS appears to have "sprung" from the sand dunes and date trees as a nearly professional military traveling in convoys of matching Toyota trucks without explanation. In actuality, ISIS is the product of a joint NATO-GCC conspiracy stretching back as far as 2007 where US-Saudi policymakers sought to ignite a region-wide sectarian war to purge the Middle East of Iran's arch of influence stretching from its borders, across Syria and Iraq, and as far west as Lebanon and the coast of the Mediterranean. ISIS has been harbored, trained, armed, and extensively funded by a coalition of NATO and Persian Gulf states within Turkey's (NATO territory) borders and has launched invasions into northern Syria with, at times, both Turkish artillery and air cover. The most recent example of this was the cross-border invasion by Al Qaeda into Kasab village, Latikia province in northwest Syria. On Friday, ISIS - which alienated many rebels by seizing territory and killing rival commanders - finished withdrawing from the Idlib and Latakia provinces and moved its forces toward the eastern Raqqa province and the eastern outskirts of the northern city of Aleppo, activists said. The alleged territorial holdings of ISIS cross over both Syrian and Iraqi borders meaning that any campaign to eradicate them from Iraqi territory can easily spill over into Syria's borders. And that is exactly the point. With ISIS having ravaged Mosul, Iraq near the Turkish border and moving south in a terror blitzkrieg now threatening the Iraqi capital of Baghdad itself, the Iraqi government is allegedly considering calling for US and/or NATO assistance to break the terror wave. Adding to the pretext, ISIS, defying any sound tactical or strategic thinking,has seized a Turkish consulate in Mosul, taking over 80 Turkish hostages - serendipitous giving Turkey not only a new pretext to invade northern Iraq as it has done many times in pursuit of alleged Kurdish militants, but to invade Syrian territory where ISIS is also based. Turkish Prime Minister Recep Tayyip Erdogan's ban of YouTube occurred after a leaked conversation between Head of Turkish Intelligence Hakan Fidan and Turkish Foreign Minister Ahmet Davutoğlu that he wanted removed from the video-sharing website. The leaked call details Erdogan's thoughts that an attack on Syria "must be seen as an opportunity for us [Turkey]". In the conversation, intelligence chief Fidan says that he will send four men from Syria to attack Turkey to "make up a cause of war". Instead of four men carrying out a false flag to secure a tomb, it appears now that an entire mercenary army will be used as a pretext to secure all of northern Iraq and eastern Syria. 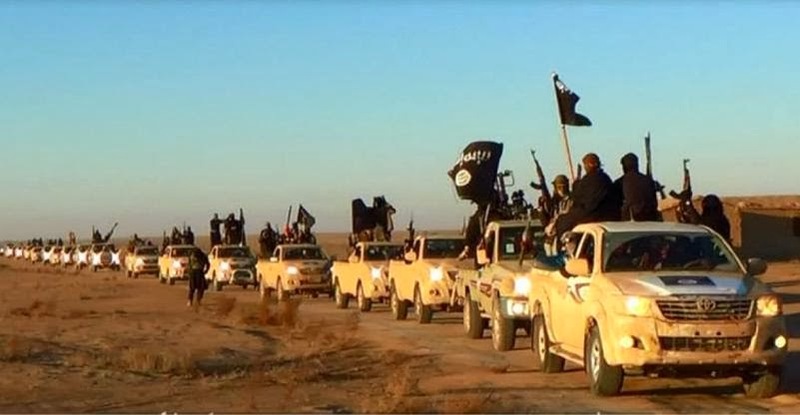 Tales of ISIS looting armories, vehicle depots, and banks are being carefully planted throughout the Western media in an attempt to portray the invasion as a terrorist uprising, sustaining itself on plundered supplies, weapons, and cash. In reality, ISIS already possessed all that it needed before beginning its campaign from Syrian and Turkish territory. This cover story is the latest in a long propaganda campaign designed to cover up the extensively documented state sponsorship of ISIS and other Al Qaeda franchises by the United States, NATO, and the Persian Gulf monarchies. Previous attempts to explain why alleged "moderates" being funded billions by the West were being displaced by Al Qaeda in Syria have included claims that "Twitter donations" were eclipsing the combined aid provided by the US, EU, NATO, and Persian Gulf states. The Western media and the governments providing them their talking points now expect the general public to believe that somehow "Twitter donations" and "bank robberies" have managed to outpace this unprecedented multinational logistical feat and give Al Qaeda the edge over the West's nonexistent "moderate" forces in Syria and give rise to phantom terrorist legions capable of seizing entire provinces across multiple national borders. The evidence simply doesn't add up. Combined with reports from the US Army's West Point Countering Terrorism Center, "Bombers, Bank Accounts and Bleedout: al-Qa'ida's Road In and Out of Iraq," and "Al-Qa'ida's Foreign Fighters in Iraq," it is clear that Iraq's Al Qaeda/ISIS legions were created, funded, and armed by Persian Gulf states and are augmented with foreign fighters drawn from Libya's terror epicenter of Benghazi, and Saudi Arabia in particular. These legions have been in operation in one form or another since they were first created by the US CIA, Saudi Arabia and Pakistani intelligence during the 1980's to combat Soviet forces in Afghanistan. 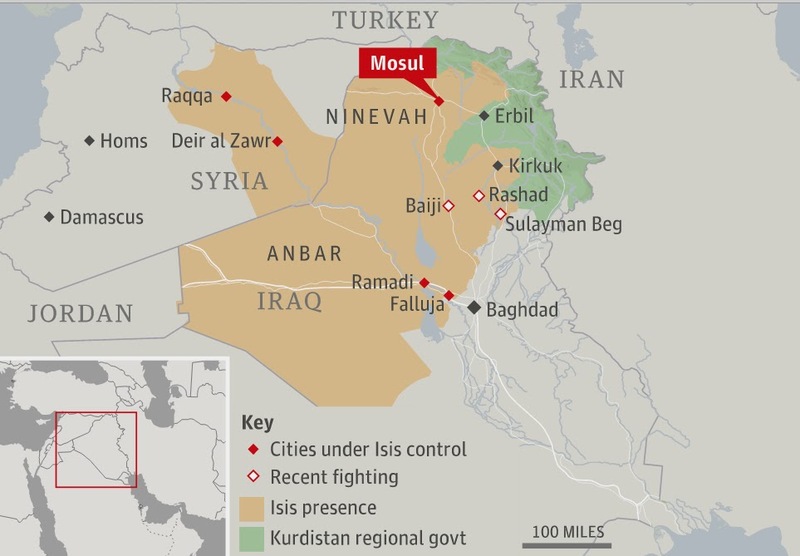 The alleged territory of ISIS overlaps the Iraqi-Syrian border constituting a region nearly the size of Syria itself. With Baghdad asking for foreign intervention, and ISIS giving NATO the perfect pretext to do so by seizing a Turkish consulate in Mosul, making the case for (re)invading Iraq may be feasible. With the Western media capitalizing on ISIS' notorious brutality, including mass beheadings and hundreds of thousands of civilians fleeing before them, a demonstrable campaign to sway public opinion toward intervention is clearly under way. Invading northern Iraq will allow NATO to then justify cross-border operations into eastern Syria. In reality what NATO will be doing is establishing their long desired "buffer zone" where terrorists can launch attacks deeper and more effectively into Syrian territory. With western Syria returning to peace and order after a series of victories for the Syrian government, the last front NATO's proxy forces have is Al Qaeda's arch of terror running along Turkey's border and now, across eastern Syria and northern Iraq. NATO's presence in northern Iraq would also provide an obstacle for Iranian-Syrian trade and logistics. Through Iraq, NATO has used its terrorist proxies to create a pretext to put this "buffer zone" strategy back into motion. The prospect of the US, NATO, or the Persian Gulf states delivering Iraq from ISIS is an ironic tragedy - as definitive evidence reveals ISIS' brutal incursion was of this collective coalition's own doing to begin with, and for its own insidious ends. Instead, a joint Iranian-Iraqi-Syrian anti-terror campaign should be conducted to corner and crush NATO's terrorist mercenary expeditionary force once and for all.